A bone marrow transplant is a procedure done to replace the damaged or destroyed bone marrow due to disease, infection, or chemotherapy. This procedure involves transplanting blood stem cells so that they can travel to the bone marrow and produce new blood cells as well as assist in the growth of the new bone marrow. Bone marrow contains immature blood-forming stem cells known as hematopoietic stem cells (HSCs). These cells are unspecialized and have the ability to multiply through cell division and either remain stem cells or differentiate and mature into other different kinds of blood cells. Thus, it helps the body to make enough white blood cells, platelets, or red blood cells to avoid infections, bleeding disorders, or anemia. Healthy stem cells can come from a healthy donor or from your own body. Stem cells can be harvested, or grown, prior to the start chemotherapy or radiation treatment. Cells of bone marrow can be frozen for prolonged periods without damaging. In autologous HSC the cells must be harvested from the recipient many months in advance of the transplant procedure as opposed to allogeneic transplants wherein fresh HSC are preferred. 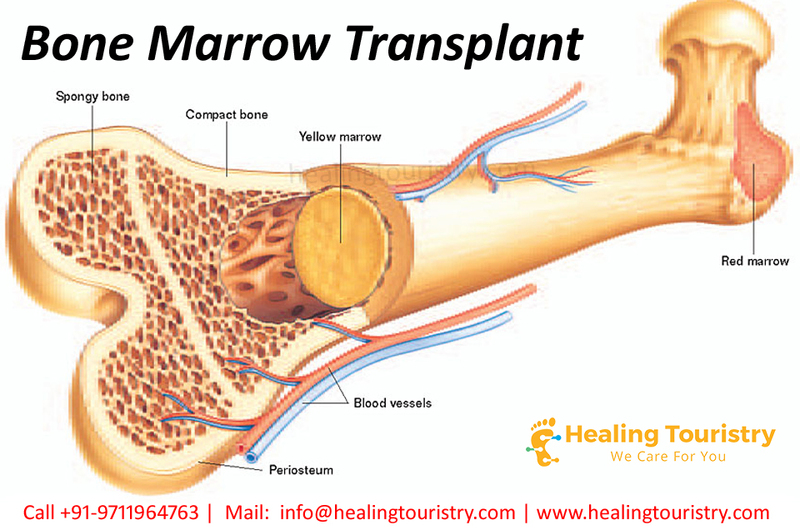 Bone Marrow Transplant in India, bone marrow transplants are performed when a person’s marrow is not able to function properly. This may be due to disease, chronic infections, or cancer treatments. Some reasons for a bone marrow transplant include aplastic anemia in which the marrow stops making new blood cells, cancers such as leukemia, lymphoma and multiple myeloma, damaged bone marrow because of chemotherapy, congenital neutropenia that causes recurring infections, sickle cell anemia that causes misshapen red blood cells, thalassemia where the body makes an abnormal form of hemoglobin required for red blood cell. What Are the Complications with a Bone Marrow Transplant? The short-term complications include a drop in blood pressure, headache, nausea, pain, shortness of breath, chills, and fever. Complications can be occasionally serious, and they can include: graft-versus-host disease (GVHD) in which donor cells attack your own body, graft failure when transplanted cells don’t begin producing new cells as planned, bleeding in the lungs, brain, and other parts of the body; cataracts characterized by clouding in the lens of the eye, damage to vital organs, early menopause, anemia, which occurs when the body does not produce enough red blood cells, infections, nausea, diarrhea, or vomiting, mucositis; soreness in the mouth, throat, and stomach. The chances of developing these complications depend on several factors, including your age, your overall health, the disease you’re being treated for, and the type of transplant you have received. The procedure of a bone marrow transplant is very much similar to a blood transfusion. If you are having an allogeneic transplant, bone marrow cells will be harvested from your donor a day or two prior to the procedure. If your own cells are being used (autologous transplant), they will be retrieved from the stem cell bank. For a bone marrow harvest, cells are collected through a needle from both hipbones. You will be under anesthesia for this procedure, meaning you will be asleep and free of any pain.